Unlimited available	 Horse Summer Camp! $500.00 Welcome! 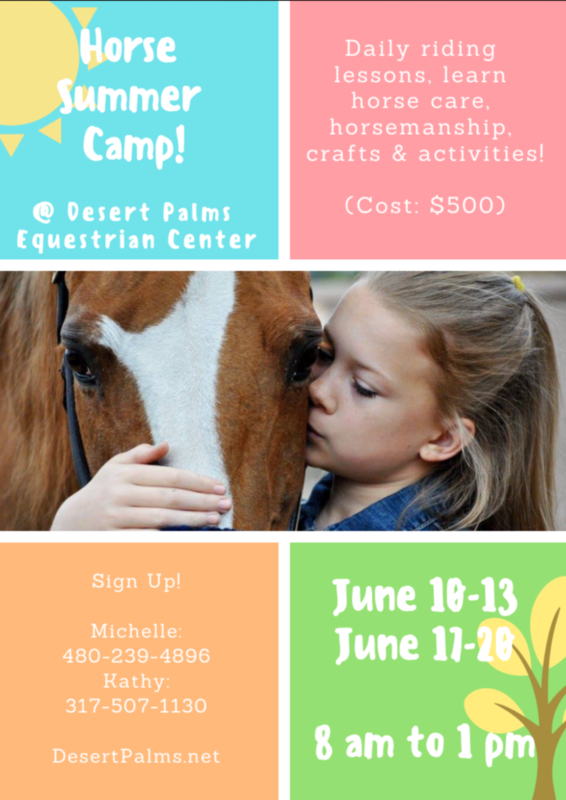 By purchasing this ticket, you are claiming you have read and understand all details listed on this page and on https://desertpalms.net/riding-camps/horse-summer-camp-2019-2/ Make sure you fully understand the details BEFORE purchasing a ticket. You will also be required to fill out a liability waiver for your children at desertpalms.net/waivers . Thank you. Students ride daily during camp sessions. This is for beginner and intermediate level riders. They will also learn all aspects of horse care. Campers learn to groom, bathe, saddle and bridle horses and more. Some other subjects taught may include: horse health and physiology, barn management, different horse breeds, show grooming and other horse-related educational topics. It is recommended that your child take a riding lesson prior to this camp. A lesson will get them familiar with their instructor. It will also help them get familiar with the horse they are going to ride. The riding lesson will also help them feel comfortable at Desert Palms and get them ready for camp. Spots are limited! Book your spot today! Ticket is good for entry into the Desert Palms Equestrian Summer Riding Day Camp. A completed waiver must be completed before arrival! A link to fill it out online will be sent with your order. Riders must wear long pants, hard soled shoes or boots with a heel, and dress for warm weather. Apply sunscreen prior to camp. Riding helmets are mandatory. You may bring your own equestrian helmet or we can supply one. Please bring iced water bottle(s) each day with your name on it as well as a sack lunch. Children ages five (5) years old and older will be permitted. This camp runs 4 days: June 17th through June 20th, 2019. Each camp day starts at 8:00AM sharp and runs until 1:00PM.